Spread the Christmas spirit with this magical Christmas gift and Plan Gift Card. 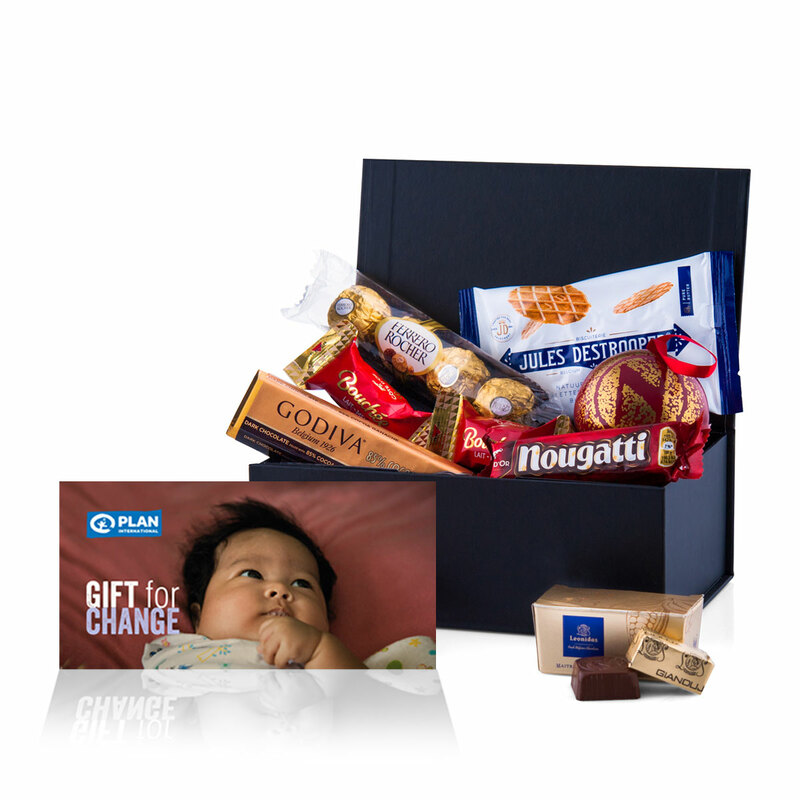 Your friends and family will be delighted with the delicious assortment of Christmas treats, and even more so when they learn their gift helps to give a baby in a developing country a good start in life. A stylish gift box is filled with a luxury assortment of sweet treats: a Godiva bar dark chocolate ganache 85%, two Côte d'Or Bouchées and a Nougatti bar, 4 scrumptious Ferrero Rochers, a Neuhaus Christmas ball filled with 6 chocolates, Jules Destrooper "On The Go" Butter Waffles, and a petite Leonidas ballotin with 2 chocolates. Thanks to this Christmas gift, Plan International Belgium is able to provide a good start in life for a baby. Plan’s Early Childhood Care and Development projects support mothers from the moment they get pregnant. Young parents get advice and training about their child’s development and nutrition. That way little ones get a steady base for a better future!